Check out our new TAB above called 2013 OPRA LOG! GallowayTwpNews.com has obtained through an Open Public Records Request (OPRA), the Township Clerk's 2013 OPRA Log. The Log provides detail of each OPRA Request submitted from January 1, 2013 to June 12, 2013. If you are interested in obtaining a copy of a request below, you can email Township Clerk TC Kay at tkay@gtnj.org. 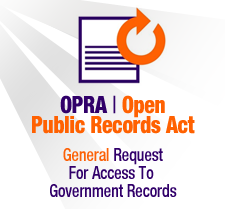 Indicate you are requesting a copy of the OPRA Request as well as the documents released. Include the "Tracking Number" of the request. You must be a New Jersey resident to obtain documents. If you wish not to submit your request directly to the Township, you can email GallowayTwpNews.com at gallowaytwpnews@gmail.com with the Tracking Number of the request and will obtain the documents for you. Please provide your name and address with your request. You must be a New Jersey resident to obtain documents. We will periodically update the OPRA Log per Month.